Attending conferences like the 2013 American Library Association (ALA) Annual Conference (held over the past several days here in Chicago) always provides a reminder, both positive and negative, of how far we have come in coping with life in an onsite-online world—and how far we still have to go in effectively using social media tools. The opportunity to see and learn from colleagues is clearly a huge attraction for many of us; doing business (on the committees on which we serve, with the vendors upon whom we rely, and, for those of us working as consultants, with current and prospective clients) as well as having those spur-of-the-moment unplanned conversations that invariably happen even when there are more than 25,000 people onsite are absolutely inspirational. And combining our onsite presence with online activity through the Twitter backchannel, Facebook postings, and other online activities via laptops and mobile devices means that we have hundreds of onsite-online colleagues helping us find meetings, learning opportunities, after-hours gatherings, and other shared conference experiences we might otherwise have missed. There is even an attempt to actively include those who are unable to physically attend the conference: the usual #ALALeftBehind hashtag not only kept us in contact with those who were interested but unable to attend—it often offered tongue-in-cheek opportunities to participate through virtual #alaleftbehind conference ribbons and even a very clever opportunity to be virtually photographed with a popular conference attendee. As has been the case with other conferences I’ve attended, the ALA 2013 Annual Conference began with a bit of confusion about how best to reach colleagues arriving in Chicago. During the days leading up to the conference, many of us had inaccurately assumed that the official conference hashtag was #ala13—the conference URL started with “ala13”; there were numerous references online to that hashtag; it was the shortest possible combination many of us could imagine as a way of keeping up with each other (and when you only have 140 characters to convey a message, every typed character has to count); and the Twitter feed for #ala13 was very active. It wasn’t until many of us were onsite, however, that colleagues were nice enough to post tweets calling our attention to the official hashtag (#ala2013, with its extra two characters). The result, throughout the conference, was that any of us hoping to reach the largest possible number of colleagues ended up using both hashtags in our posts—a situation similar to what often happens with colleagues in the American Society for Training & Development (ASTD) who face the #astd13/#astd2013 challenge when attending and/or following conference exchanges via Twitter. There were many times when both feeds were moving so quickly that it was impossible to either follow them in the moment or to follow them later by skimming earlier posts, for taking the time to try to review tweets invariably meant falling behind in the ever-developing stream of comments. American Libraries Senior Editor Beverly Goldberg (@americanlibraries) offered a playfully subjective bit of assistance by compiling lists of Top 10/Top 20 tweets while the conference was fully underway on Friday, Saturday, Sunday, and Monday. Reviewing her picks gives a wonderful overview of content—everything ranging from snippets from notable presentations to comments about the length of the lines at the onsite Starbucks outlets. What doesn’t show up in those Top 10 lists is the reminder that some of our colleagues apparently need reminders that what happens in Twitter doesn’t necessarily stay in Twitter. There were the usual snarky comments from those who felt they needed to play den mother to the rest of us through cajoling notes about not wearing conference badges while walking city streets (I can’t imagine anyone reading one of those comments and thinking, “Oh, yes, that’s very helpful; thank you for making me a more responsible representative of my profession.”); standing to the right side of escalators so others could race up the left-hand side (why bother? the lines were going to be long at Starbucks no matter what time you arrived); and even writing critical comments to presenters while those presenters were in the middle of their presentations and clearly not paying any attention to the backchannel. All that those tweeters accomplished was to make the rest of us a little hesitant to have anything to do with them since those notes, at very least, indicated a level of incivility that present and future employers can’t help but notice. There are certainly thousands of attendees who had great conference experiences without ever stepping into the Twittersphere and interacting at that level; there are also many of us who found our overall experience enhanced by combining our onsite and online presences. And now, as I’ve written after intensively engaging in other conferences, it’s nearly time to think about engaging in a digital media fast to decompress from several days of nonstop connectivity. But not quite yet: there are a still a few more tweets to read and a few more articles to complete. I already had quite a few friends and colleagues in the world of training-teaching-learning a couple of weeks ago. Now the social fabric that sustains me has grown quite substantially. Let’s credit the backchannel for this change. Then think about what that backchannel could mean to you and all you serve. Seeing dynamically interactive online extensions of the American Society for Training & Development (ASTD) 2012 International Conference & Exposition Twitter backchannel in the week since the conference ended provides all of us with yet another example of how blended the world has become for trainer-teacher-learners. How quickly we are informally and quite naturally developing the sort of blended onsite-online social learning center/fourth places colleagues and I have been exploring. And how the interactions we have at conferences no longer start and end with physical onsite arrivals and departure. As is the case with any form of effective training-teaching-learning, those conference interactions flourish through planning before the learning event/conference begins (someone has to create the Twitter hashtag that draws us all together); active participation during the event (the more you give, the more you receive); and sustainable long-term attention that continues far beyond the days a learning opportunity/conference brings us all together (following and contributing to the backchannel after the conference ends keeps this virtual social learning center alive and vibrant). 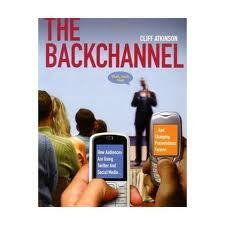 And discovering Cliff Atkinson’s The Backchannel: How Audiences Are Using Twitter and Social Media and Changing Presentations Forever as I was beginning to resurface a bit from the ASTD conference backchannel (#ASTD2012) a few days ago tells me that the best is yet to come in terms of where backchannels deliver on the promises they are offering. An effective backchannel, as I wrote in an earlier article, works at many levels. It connects those who might otherwise be separated by the smallest as well as the largest of physical distances. It fosters a form of mobile learning (m-learning) in that what we’re learning is disseminated to an even larger group of learners. It is increasingly providing a delightfully accessible tool that can as easily facilitate and augment the learning process in academic settings as it can in workplace learning and performance (staff training) endeavors. If you already sense that Atkinson’s mastery of storytelling and training is a wonderful talent to see in action, you’re well on the way to understanding that his book has something for each of us regardless of whether we’re new to the backchannel or already fairly comfortable in that rapidly-flowing stream of words and thoughts and resources. He shows us how to join a backchannel. Entertainingly reviews the rewards and risks of backchannel engagement with copious amounts of screenshots to lead us down that path. Offers presentation tips to make us more effective in our use of Twitter and its backchannels. And leads us through the process of effectively dealing with those dreaded-yet-inevitable moments when a backchannel becomes dangerous. By the time we finish racing through this book and absorbing what we can—I suspect I’ll be rereading this one at least a few times— we’re far more comfortable with and appreciative of all that backchannels offer, and much more aware of how to be effective and civil members of the Twitterverse and its various interconnected streams. We’re richer for having explored and reflected upon the online resources supporting the book, e.g., his “Negotiating a Backchannel Agreement.” And we’re appreciative for what our own levels of involvement in backchannels returns to us. Through the #ASTD2012 backchannel and subsequent online interactions including the #lrnchat session on May 17, 2012 , I came away from a conference with 9,000 attendees much richer at a deeply personal and professional level than I was two weeks ago. Through their confrontation and subsequent discussion, the tweeter and the presenter in Atkinson’s book walked away with their differences resolved. And you—yes, you—may end up finding your own rewards and satisfactions there the moment you are prepared to take the plunge into the backchannel/The Backchannel. You have searched the Building Creative Bridges blog archives for ‘backchannel’. If you are unable to find anything in these search results, you can try one of these links.